As you launch your career in design engineering, make sure you design a resume that does justice to your qualifications. Get inspired by this sample. As you launch your career in design engineering, make sure you design a resume that does justice to your qualifications, says resume expert Kim Isaacs. 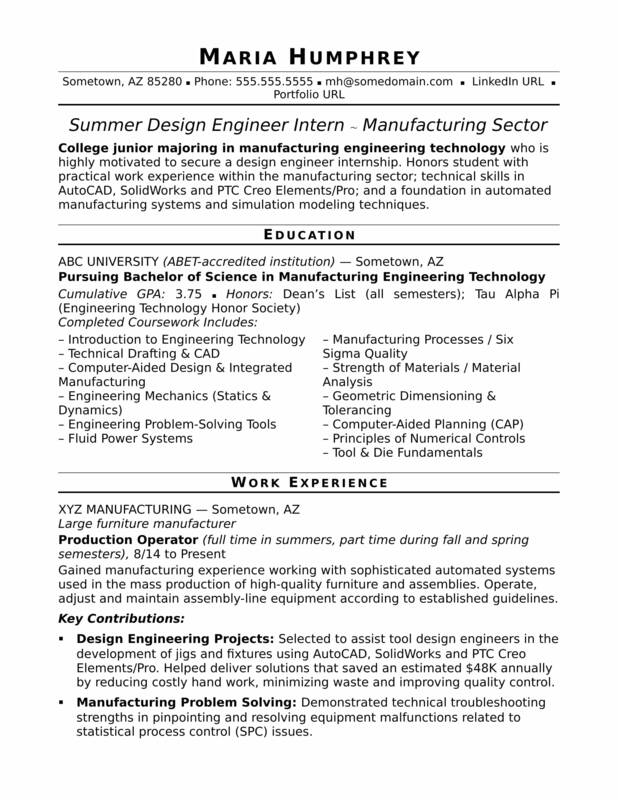 Get inspired by this resume sample for an entry-level design engineer that Isaacs created below, and download the entry-level design engineer resume template in Word. And if you need more help, get a free resume evaluation from the experts at Monster's Resume Writing Service. Jobs for design engineers are projected to grow by 10% (or 25,100 jobs) from 2016 through 2026, according to the Bureau of Labor Statistics (BLS). You’ll find the highest level of employment for this job in the following states: Michigan, California, Texas, Ohio, and Illinois; and in the following metropolitan areas: Warren, Michigan; Minneapolis, Los Angeles, Chicago, and Detroit. Additionally, you can learn more about engineering careers and creative design careers, and search for design engineer jobs on Monster. College junior majoring in manufacturing engineering technologywho is highly motivated to secure a design engineer internship. Honors student with practical work experience within the manufacturing sector; technical skills in AutoCAD, SolidWorks and Creo Elements/Pro; and a foundation in automated manufacturing systems and simulation modelling techniques. Gained manufacturing experience working with sophisticated automated systems used in the mass production of high-quality furniture and assemblies. Operate, adjust and maintain assembly-line equipment according to established guidelines. Design Engineering Projects: Selected to assist tool design engineers in the development of jigs and fixtures using AutoCAD, SolidWorks and Creo Elements/Pro. Helped deliver solutions that saved an estimated $48K annually by reducing costly hand work, minimizing waste and improving quality control. Manufacturing Problem Solving: Demonstrated technical troubleshooting strengths in pinpointing and resolving equipment malfunctions related to statistical process control (SPC) issues. Production Line Operations: Consistently commended for adhering to company SOPs to ensure optimal production efficiency, quality and safety. Top-Rated Performance: Earned outstanding marks on performance reviews, with special recognition for teamwork, attention to detail and going “above and beyond” to drive corporate goal attainment.